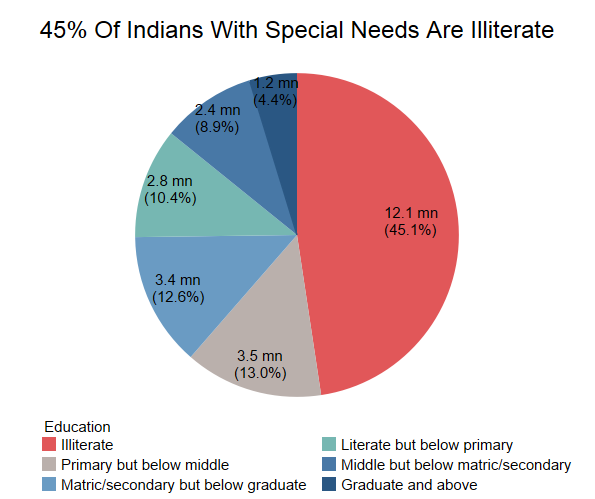 Compared to a national average of 26%, 45% of Indians with disabilities are illiterate. 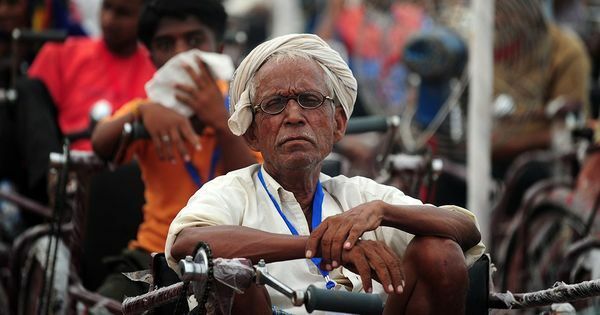 In a message at the launch of the government’s Accessible India Campaign in December 2015, Prime Minister Narendra Modi suggested the term “divyaang” – which translates to divine body – for persons with disability, instead of the usual “viklaang”, or handicapped. He said persons with disability are divinely blessed with “extra gifts”. Many disabled rights groups later wrote to the prime minister arguing that changing terminology alone would not end the discrimination that persons with disability face, and asking him to address the barriers that hinder their participation in the country’s economic, social and political life. In this three-part series, IndiaSpend examines what living with disability in India means, particularly with regard to access to education and employment, 22 years after the Persons with Disabilities (Equal Opportunities, Protection of Rights and Full Participation) Act was passed. The first part of this series looks at education: whether the current system allows equal access for children with special needs to various education-related programmes. In the second part, we will look at the “inclusive education model” through the lens of one differently-abled boy’s life. The third and final part will examine employment opportunities for people with disabilities through the story of a visually-challenged community living in Vangani, 80 km east of Mumbai. As things stand, 45% of India’s disabled population is illiterate, according to Census 2011, compared to 26% of all Indians. Of persons with disability who are educated, 59% complete Class X, compared to 67% of the general population. Despite the promise of universal access to education through the Sarva Shiksha Abhiyan (Education for All Movement), which promotes free and compulsory education for all children between the ages of six and 14, children with special needs form the largest out-of-school group in India. Some 600,000 (28%) special-needs children between six and 13 years of age are out of school, according to the 2014 National Survey of Out of School Children report, at a time when India has almost universal primary school enrolment. Among children with special needs, as many as 44% of children with more than one disability are out of school, and children with mental (36%) and speech (35%) disabilities are more likely to be out of school than those with other kinds of disability. A higher percentage of children with hearing disability, orthopaedic/locomotive disability and visual disability go to school, with only 20%-30% failing to do so, according to this 2014 United Nations Educational Scientific and Cultural Organization report. Clearly, policies have to be more finely tailored to serve children across the disability spectrum. Experts also emphasise the need to go beyond providing just physical access. For instance, the Accessible India Campaign aims to make 50% of all government buildings in the national capital and state capitals accessible by July 2018; the larger goal is a move towards creating universal access, equal opportunity for development and independent living and participation in all aspects of life for people with disabilities. However, those with experience on the ground talk of a different reality. Getting special-needs children into school is only the beginning. Once in school, these children need user-friendly instruction and teaching equipment. However, Juvva said, policy-makers perceive of this as an additional investment. “Are we ready to buy software that helps a child with visual impairment or cerebral palsy to learn?,” she said, adding that a new mindset is needed to create policies and programmes that work seamlessly towards the goal of integrating children with special needs with the mainstream. 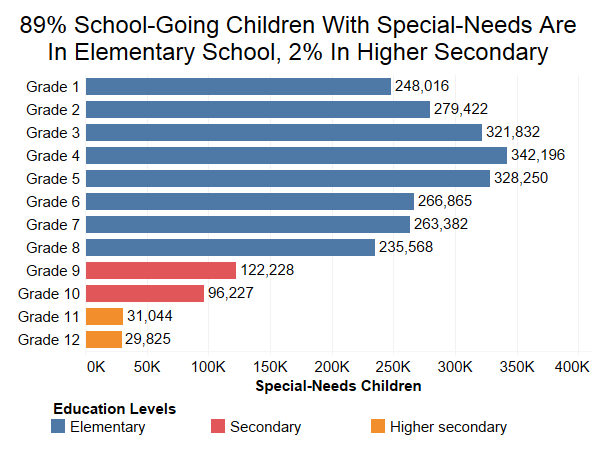 Within special-needs children who are enrolled in school, the number drops steadily in higher grades, with a drop after Class 8 (48%, compared to 2.6% for all children) and Class 9 (21%, compared to 6.8% for all children), according to the 2015-’16District Information System for Education data. As a result, although 89% of school-going children with special needs are in elementary school (Class 1 to Class 8), 8.5% are in secondary school (Class 9 and Class 10) and 2.3% in higher secondary (Class 11 and Class 12). Should there be special schools for children with special needs, or should they be integrated into regular classrooms? India’s policies are unclear. While the Ministry of Social Justice and Empowerment runs separate schools for children with special needs, the Ministry of Human Resource Development promotes an inclusive-education model where such children study in regular classrooms. Parents of children with special needs often find themselves having to choose between special schools and integration, with little guidance regarding which one is better for their child. Children with disability who are able to beat all the odds stacked against them to complete education upto Class 10 face another hurdle: what course to choose for higher studies, given the widespread bias about what a person with disability can or cannot do. As a result, students with disability have often had to fight to assert their right to study courses of their choice. At least two visually-challenged students have been in the news recently for approaching the courts – Kritika Purohit filed a case in the Bombay High Court to be allowed to study physiotherapy and Reshma Dileep approached the Kerala High Court to be allowed to study science beyond secondary school. “Primarily because education is a state and a central subject, there is no central body that can frame guidelines for everybody,” Neha Trivedi, project consultant with Xavier’s Resource Centre for Visually Challenged, which has assisted visually-challenged students in their legal battles, said. Even if the human resources ministry issues a circular asking all universities to allow visually challenged students to study science, each university and college has to accept the directive and enable it through its operational guidelines, she said. One instrument that can make a significant difference in the life of a person with disability is the disability certificate. Awarded to those considered to have more than 40% disability, the certificate makes its holder eligible for various state and central government schemes, scholarships, free travel, loans, prosthetic aids and appliances, and even an unemployment allowance. Medical boards of district civil hospitals are responsible for issuing disability certificates. However, over half the people with disability – 51% – did not have disability certificates by July 2015, according to figures submitted by the Ministry of Social Justice and Empowerment in Lok Sabha. The Ministry claims to have simplified the procedure for issuing disability certificates–it can be issued by any doctor at a primary health centre for disabilities such as amputations, blindness and complete paralysis, and must be issued within a month of receiving an application. In practice, however, it takes up to three to six times longer. There are only three centres which issue disability certificates that are recognised for government schemes in Mumbai – JJ Group of Hospitals, Ali Yavar Jung National Institute of Speech and Hearing Disabilities, and All India Institute of Physical Medicine and Rehabilitation – Sunil Bhadane, Special Educator, Sarva Shiksha Abhiyan, told IndiaSpend. “It takes anywhere between three to six months to receive the certificates because of the long wait to get an appointment,” he said. For people residing in rural areas, disability certificates are mandatory to avail reservation in jobs under the Mahatma Gandhi National Rural Employment Guarantee Act. There is a shortage of specialists in rural areas to issue certificates for disabilities such as cerebral palsy, autism and Down syndrome, Rajive Raturi, Director, Disability Rights, Human Rights Law Network, Delhi, told IndiaSpend. “This makes it difficult for those with these disabilities to get their certificates and avail benefits,” he said. The Ministry of Social Justice and Empowerment also plans to issue “Universal ID for Persons with Disabilities” to improve delivery of services, Minister Thaawar Chand Gehlot told the Lok Sabha in July 2015. The ministry said it would provide financial support to states and union territories for identifying recipients, but the ministry’s website says only registration has begun and no ID cards have been issued yet. In December, the Parliament approved the Rights of Persons with Disabilities Act, 2016. The new Act is an improvement on the Persons with Disabilities Act, which it replaces, as it recognises 21 types of disability including those caused by an acid attack, haemophilia, sickle cell disease and dwarfism. The previous law only recognised seven–blindness, low vision, leprosy, hearing impairment, locomotor disability, mental retardation and mental illness. There is also a provision for making national and state funds available for financial support to persons with disability. However, the budget for 2016-’17 makes no mention of this fund. Even though there were increments in the budget for central sector schemes and a 3.4% increase in the budget for autonomous bodies, the overall allocation to the department of empowerment of persons with disabilities follows a decreasing trend, an analysis of the union budget 2017-’18 by the Centre for Budget and Governance Accountability shows. The share of allocation for persons with disability fell from 1.08% of the allocation for the department in 2016-’17 to 0.98% in 2017-’18. “There is neither a specific reference to persons with disabilities under the social groups nor a commitment across sectors to address the issues of discrimination experienced by persons with disabilities,” the report said.